This is the cover for Line of Fire. All original content on this website is copyright © 1997-2016 by Will Oxford. The Hardy Boys® is a registered trademark of Simon & Schuster. 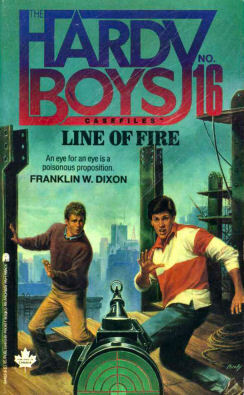 All Hardy Boys books and artwork are copyright © Simon & Schuster. The Hardy Boys Online is an unofficial fan website which is not affiliated with Simon & Schuster in any way.